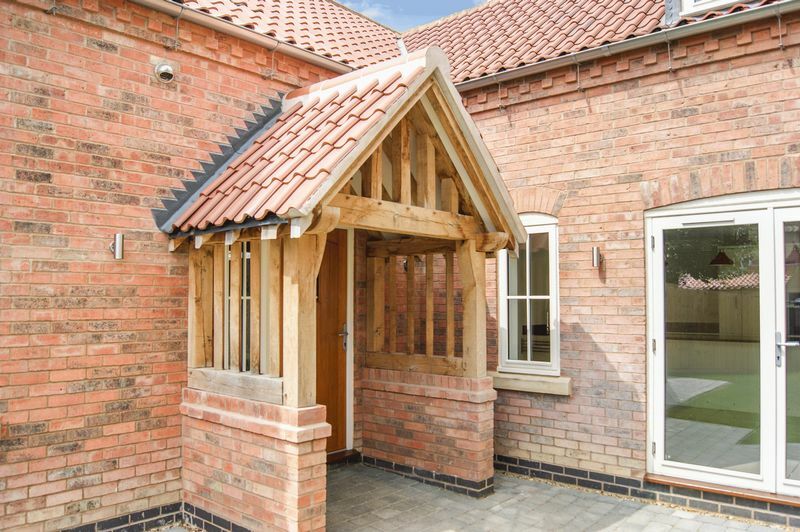 Orchard Cottage is a fabulous newly constructed four bedroom detached family home situated on a private plot within this popular village location. In addition to the four spacious bedrooms, the property has an excellent sized lounge, a superbly appointed breakfast kitchen, and three bathrooms. 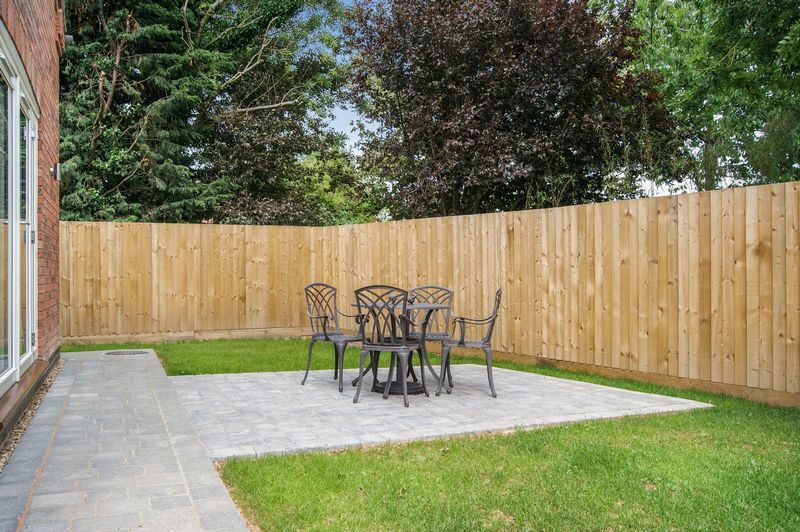 This property has been constructed and finished to a very high specification, and the entire ground floor is complemented with under-floor heating. Early viewing is very strongly recommended. 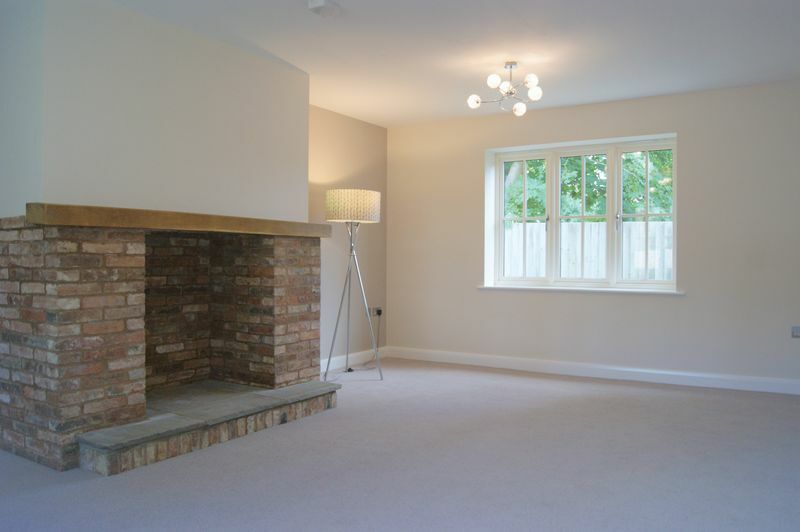 The highly sought after village of Long Bennington is well equipped with amenities including a Medical Centre, highly regarded primary school and local nursery, public houses with restaurants, post office/shop and village hall. The village is bypassed by the A1 and located approximately equi-distant between the market towns of Grantham and Newark. THERE IS A DIRECT LINE RAIL CONNECTION FROM BOTH NEWARK AND GRANTHAM STATIONS TO LONDON KINGS CROSS WHICH TAKE FROM A LITTLE OVER AN HOUR. 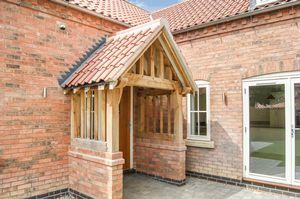 An oak framed porch leads to the front door, which in turn provides access into the entrance hallway. 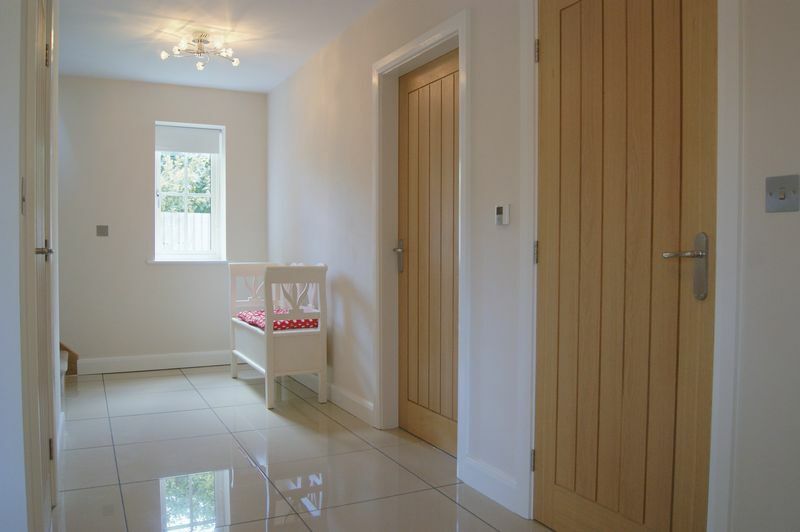 The welcoming and spacious reception hallway has the staircase rising to the first floor, and doors leading into the lounge, the breakfast kitchen, the family room/bedroom two and the downstairs cloakroom. There is also a window to the rear elevation. Located within the hallway is a large and useful storage cupboard. The hallway itself is enhanced with high gloss ceramic tiled flooring. In addition there are two ceiling light points. This excellent sized and very well proportioned reception room has dual aspect windows to the front and rear elevations, the window to the front overlooking the garden and driveway. The focal point of the lounge is the feature brick fireplace with oak mantle, this fireplace has been designed and equipped with a chimney liner ready for the installation of a wood burning stove. The lounge also has two ceiling light points and carpeted flooring. The downstairs cloakroom is fitted with a WC and a vanity unit with wash hand basin inset and storage beneath. The cloakroom is complemented with the same ceramic tiled flooring that flows through from the hallway, together with recessed ceiling spotlights. There is also an extractor fan and a heated towel rail. 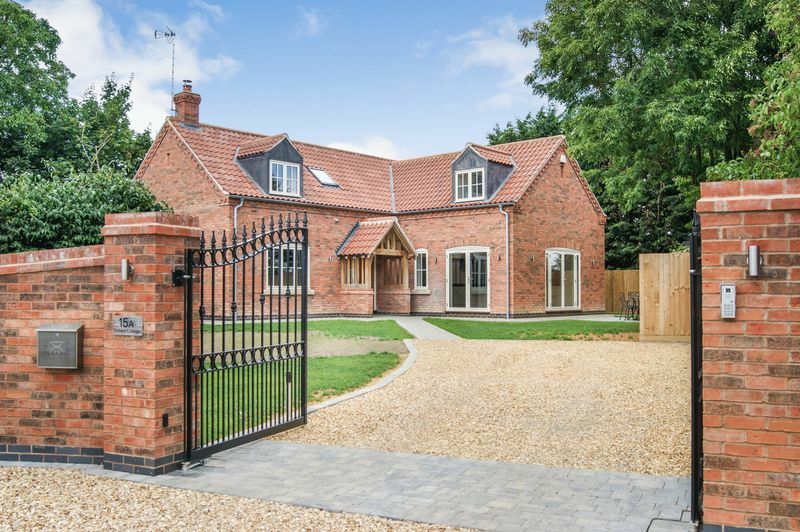 The fabulous breakfast kitchen is the heart of this wonderful family home, and has a window to the front elevation and two sets of glazed French doors providing alternative access points out to the garden. 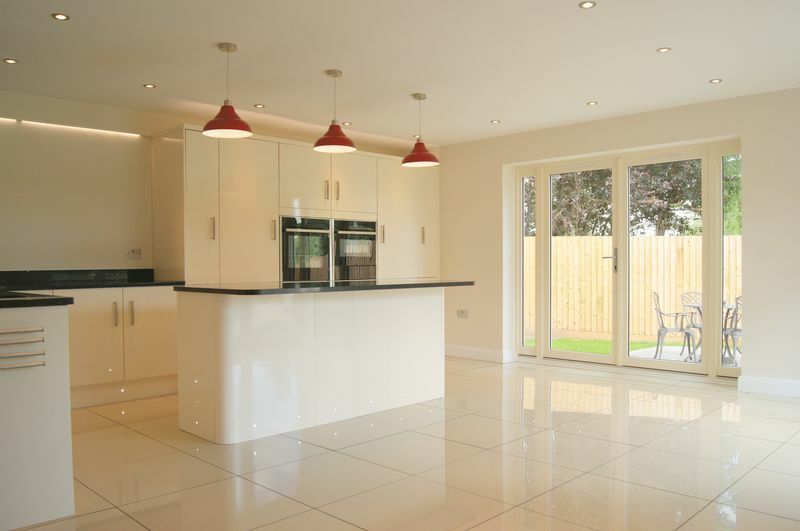 The kitchen itself is fitted with a very comprehensive range of contemporary units, complemented with granite work surfaces. There is a one and a half bowl Blanco sink, and integrated appliances include a Neff ceramic hob with contemporary Neff extractor hood above, twin eye level ovens, fridge, freezer, dishwasher and a wine fridge. There is a central island which also doubles as a breakfast bar. The kitchen is further complemented with kickboard lighting. The breakfast kitchen is of sufficient size to comfortably accommodate a dining table and occasional furniture. The entire room is enhanced with the same ceramic tiled flooring that flows through from the hallway, together with recessed ceiling spotlights, and triple ceiling light points above the breakfast bar area. From the kitchen there is a door into the utility room. The utility room has a window to the rear elevation, and a glazed door leading out to the rear garden. The utility room is fitted with an excellent range of base units and cupboards to match those of the kitchen, and once again is complemented with granite work surfaces. 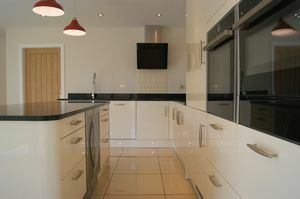 There is a one and a half bowl Blanco sink, and the central heating boiler is also located in the utility room. This room also has the same ceramic tiled floor that flows through from the kitchen. In addition there is a ceiling light point and an extractor fan. This excellent sized room can serve equally well as an additional reception room, or a delightful guest bedroom. There is a window to the rear elevation, carpeted flooring and a ceiling light point. A doors leads through to the en-suite shower room. The very well appointed en-suite shower room has an opaque window to the rear elevation and is fitted with a walk in shower cubicle with mains rainwater head shower, and curved shower screen. There is a contemporary vanity unit with wash hand basin inset and storage beneath, and a WC. The en-suite is complemented with ceramic floor and wall tiling, together with recessed ceiling spotlights, a heated towel rail and an extractor fan. As previously mentioned, the staircase rises from the reception hallway to the first floor landing which provides access to the three additional double bedrooms, and the family bathroom. Located on the landing is the airing cupboard, and a further useful storage cupboard located within the eaves. 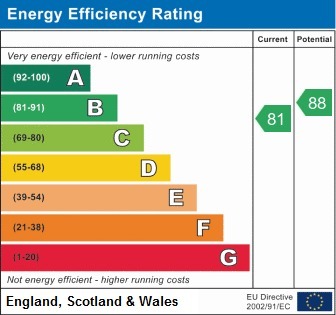 In addition there is a skylight window to the front elevation, a ceiling light point and a radiator. This delightful double bedroom has a dormer window overlooking the front garden and driveway, and a skylight window to the rear. 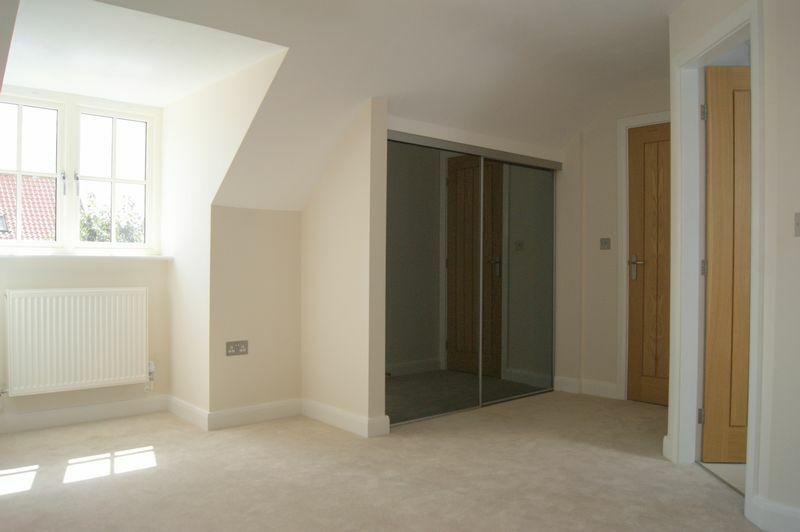 This bedroom benefits from having a fitted double wardrobe with soft close sliding doors, and further useful storage space located within the eaves. Bedroom one has a ceiling light point and a radiator, and also provides access to the loft space. 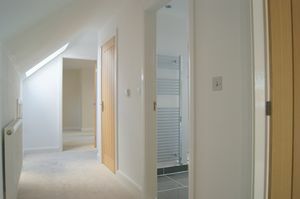 A door leads through to the en-suite shower room. The en-suite has a skylight window to the rear elevation, and is fitted with a walk in shower cubicle with mains shower, contemporary vanity unit with wash hand basin inset and storage beneath, and a WC. The en-suite is enhanced with ceramic floor and wall tiling and recessed ceiling spotlights. In addition there is a heated towel rail and an extractor fan. An excellent sized double bedroom with a dormer window overlooking the front garden and driveway. There is also a skylight window to the rear elevation. This room has a useful storage cupboard located within the eaves, a ceiling light point and a radiator. 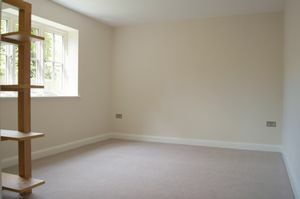 A further very good size double bedroom with two skylight windows to the rear elevation. This bedroom has a comprehensive suite of fitted wardrobes with soft close sliding doors, and further storage space within the eaves. There is further access to the loft space from bedroom four. In addition there is a ceiling light point and a radiator. 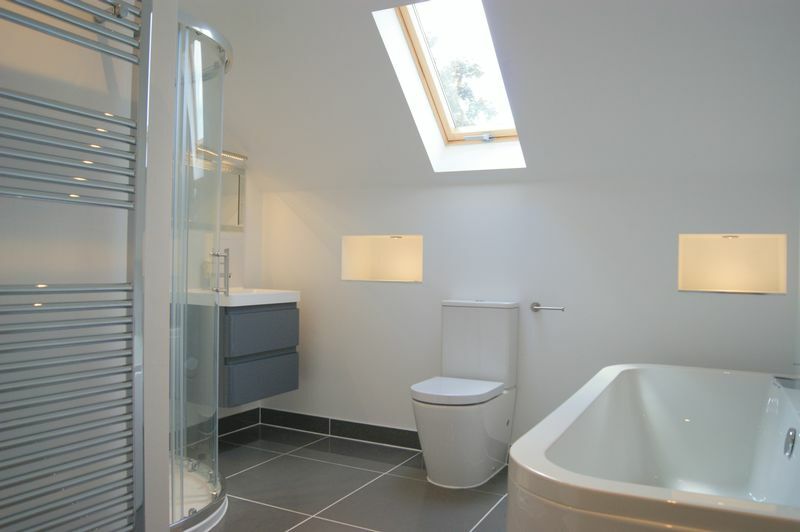 This exceptionally well appointed bathroom has a skylight window to the rear elevation and is fitted with a white suite comprising bath, contemporary vanity unit with wash hand basin inset and storage beneath, and a WC. In addition there is a walk in shower cubicle with mains rainwater head shower, and curved shower screen. The bathroom is complemented with ceramic wall and floor tiling and recessed ceiling spotlights. There is also a heated towel rail and a radiator. 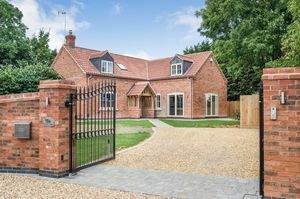 The property is approached via electrically operated wrought iron gates which in turn lead on to the gravelled driveway. The principal gardens are situated to the front of the property, and are currently laid to lawn. There is a block paved footpath leading to the front door, and around the sides of the property. There is a block paved patio area adjacent to the French doors from the breakfast kitchen. 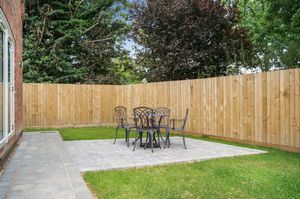 The lawned gardens continue from the front of the property, around either side and to the rear where there are further areas to established additional outdoor seating and entertaining spaces, or the erection of garden buildings. 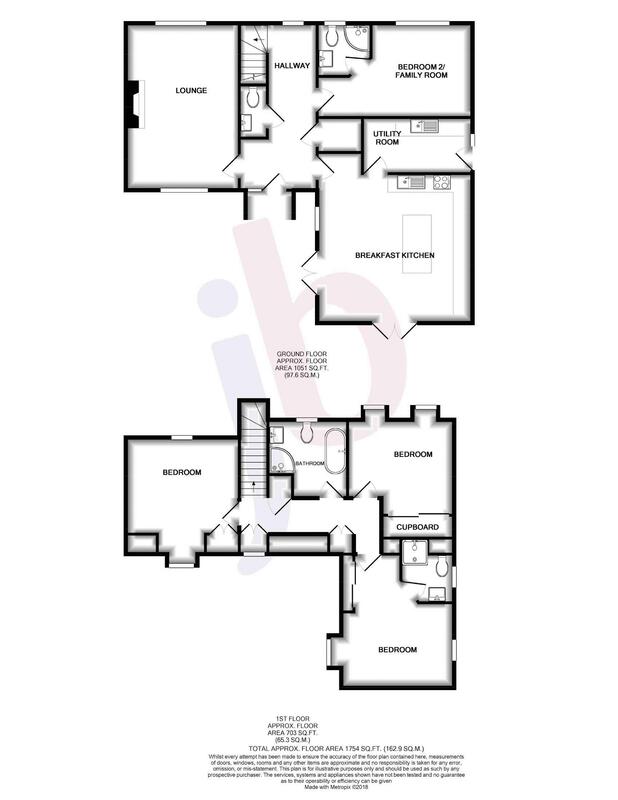 There is also ample space located to the front of the property should a prospective purchaser wish to extend the driveway or construct a garage, subject to the appropriate planning consents being obtained.